The BMW X7 has made its first public outing at the Los Angeles motor show ahead of going on sale early next year. BMW is targeting the Land Rover Discovery and Mercedes-Benz GLS with its seventh and largest SUV to date, which was previously shown off in production form. The seven-seater is set for UK delivery next March at a price of £72,155 for the entry-level X7 xDrive30d. Conceived to provide BMW with a greater presence in the growing upper-luxury SUV market, the X7 aims to offer the comfort and opulence of a 7 Series with the versatility and off-road prowess of the new fourth-generation X5, with which it shares much of its mechanical and electrical architecture. Key markets for the X7, which goes under the internal codename G06, are the US, China, Russia and the Middle East. To bolster growth in those luxury-driven markets, BMW is rumoured to be working on an even more exclusive X8 model. 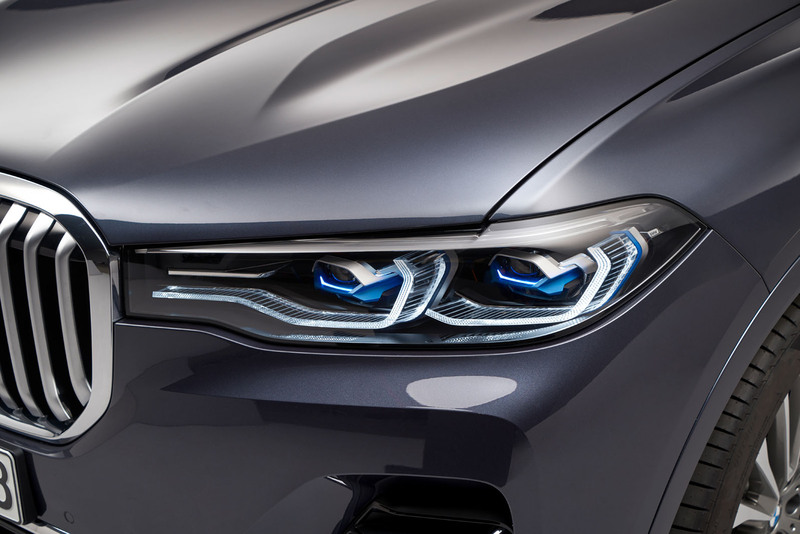 Previewed by the Concept X7 at last year’s Frankfurt show, the X7’s key design elements include a large kidney grille in an upright front end, angular LED headlights with optional laser projectors, a heavily contoured bonnet, a tall glasshouse and a two-piece electric tailgate. In keeping with its upmarket aspirations, the new model makes extensive use of chrome exterior accents and comes in two trim packages: a standard variant and the more style- focused M Sport alternative. At 5151mm in length, the X7 is a considerable 230mm longer than the new X5 and just 89mm shorter than BMW’s longest production car, the existing long-wheelbase 7 Series. The width and height of the new BMW are 1990mm and 1805mm respectively, and it has a 3105mm wheelbase. Inside, the X7 follows the same design theme as the latest X5, with a multi-layered dashboard that houses a digital instrument panel and a standard 12.3in touchscreen infotainment display. Standard equipment on all models includes four-zone air conditioning, soft-close doors, a three-piece glass sunroof and a park assistant function with a reversing camera. All three rows of seats have electric adjustment, and buyers can specify a six-seat option in a 2+2+2 configuration that includes individual second-row seats. The second row of seats are said to offer 90mm more leg room and 30mm more head room than the X5. Luggage capacity varies from 326 litres with all seven seats in place to 740 litres with the two rearmost seats folded into the boot floor. With the second row seats stowed via a standard electric mechanism, the maximum load capacity rises to 2120 litres. Four X7 models have been confirmed, although just three are destined for the UK. The expected volume-selling models include the X7 xDrive40i, which uses a turbocharged 3.0-litre straight- six petrol engine with 335bhp and a 0-62mph time of 6.1sec. It manages 32.5mpg combined and emits 198g/km of CO2. The other predicted bestseller will be the xDrive30d, which uses a 3.0-litre inline six-cylinder diesel engine making 261bhp for a 0-62mph time of 7.0sec. Its CO2 emissions are pegged at 171g/km with 43mpg claimed. The performance leader of the initial line-up is the X7 M50d. It uses a quad- turbocharged version of BMW’s 3.0-litre inline six-cylinder diesel engine that produces 394bhp and 561lb ft. This is sufficient to propel BMW’s largest and heaviest SUV to date from 0-62mph in a claimed 5.4sec and on to a limited top speed of 155mph. Its combined fuel consumption is 40mpg while CO2 emissions are rated at 185g/km. All X7 models use an eight-speed automatic gearbox and BMW’s xDrive four-wheel-drive system, with the X7 M50d featuring an electronically controlled M Sport differential as part of its standard equipment. Also available is an optional Off-Road Package, which features four surface-specific driving modes. Despite offering the new X5 with a plug-in hybrid option, BMW has not yet confirmed such a powertrain for the heavier X7 due to concerns about its electric range being below the 50-mile target stipulated by Chinese market regulations. It is understood that plans exist to modify the petrol-electric powertrain used by the X5 xDrive45e iPerformance with newer battery cell technology in order to bring the X7’s electric range closer to 60 miles. The X7 is underpinned by a double-wishbone front and five-link rear suspension set-up featuring air springs, electronically controlled damping and standard 20in alloy wheels – a combination available at extra cost on the smaller X5. Optional features on the X7 include BMW’s Integral Active Steering rear-wheel steer system, an electric anti-roll system and 21in and 22in wheels. My God, that's an ugly car!! to have left the camo wrap on! this is just another joke of a seven seat suv, It’s basically a bigger 5 seater. Just look at the picture with the guy sitting in the 3rd row. Now look at the middle seat position to where the door opens. BMW trying to manipulate the pictures to show it has more space when in fact is will barely have enough for children. Pointless,I say buy a X5 and save urself the headache of parking problems. You're going to need a bigger two truck. Agreed it's a brick on wheels, I never thought BMW would be chasing the LA gangsta rapper crowd but I see this as the next step above the Chevy Escalade are they called. I'm sure the interior is a fantastic place to be, the driving experience will be smooth and refined but these cars will depreciate like a brick off the top of a skyscraper. 6.30 odd seconds gives you a walk round and a good look at the interior, it isn’t that bad, and, having a Human to get a sense of proportion shows it isn’t that big, quite close to the Range Rover infact. I understand the giant grill now, without it, this could be from any American* manufacturer. Incredibly bland. Nothing about it says BMW, they’ve really lost their way styling wise. Although I bet they sell loads! It almost looks like it was designed with a ruler it's so boxy. At least it should be practical. But jokes aside, this is so bland that a 10 year old X5 not only looks better but actually looks more modern. I accept this market can be conservative but this is a new low for BMW.